If you are not familiar with the health benefits and uses for salt lamps, you’re missing out on an easy, soothing way to enhance your environment, your mood, and your overall health. And salt air inhalers are an all-natural way to relieve asthma, allergies and respiratory issues…. Many of the things that are now a part of our daily lives are generators of positive ions and this is one instance when positive is bad, at least when it comes to impact on our health. Computers, microwaves, cell phones, wi-fi, TVs, motors, power lines, fluorescent lights and more all fill our environment with magnetic energies that can put stresses on our physical bodies. Positive magnetic fields have been associated with cancer, depression, chromosomal abnormalities, inflammation and learning difficulties. That’s why it’s important to be sure we surround ourselves with things known to generate negative ions and that’s why salt lamps are such a good investments. They make wonderful accent pieces for your living environment, but what’s more important is that they are natural producers of negative ions. That means they improve air quality and help clean it of dust, pollen, dander, cigarette smoke, and other allergens. The lamp’s healthy ions also off-set the harmful radiation produced by computer monitors, TVs, and electrical devices, so no home or office should be without one. The bio-energetic vibrations emitted by the lamp are similar to what you experience being by the ocean, and have an uplifting effect on the general well-being of anyone in the vicinity. Negative magnetic fields are a positive thing as far as the body is concerned and help normalize the body’s pH, resolve cellular edema, clear metabolically produced toxins from the body, and eliminate free radicals. The lamps are a perfect answer for providing Feng Shui cures for buildings that have “stuck” energy (chi) and provide a natural ambiance that enhances any environment. When the small bulb (or votive candle in the salt candle holders) inside the lamp is on, the warmth and natural beauty of the glow creates a wonderful accent for any room, and can function as a mood-setter or soothing night light when the rest of the house is dark. A salt lamp makes a perfect house-warming gift, or unique present for all your health-minded friends and family. Everyone is attracted to their inviting glow and feels naturally uplifted and happier in their presence. Salt lamps come in a variety of sizes, so you don’t necessarily have to spend an arm and a leg to own one; usually just an arm will suffice (just kidding!). And now that people are more aware of the health benefits they bring, they are available through a number of companies. 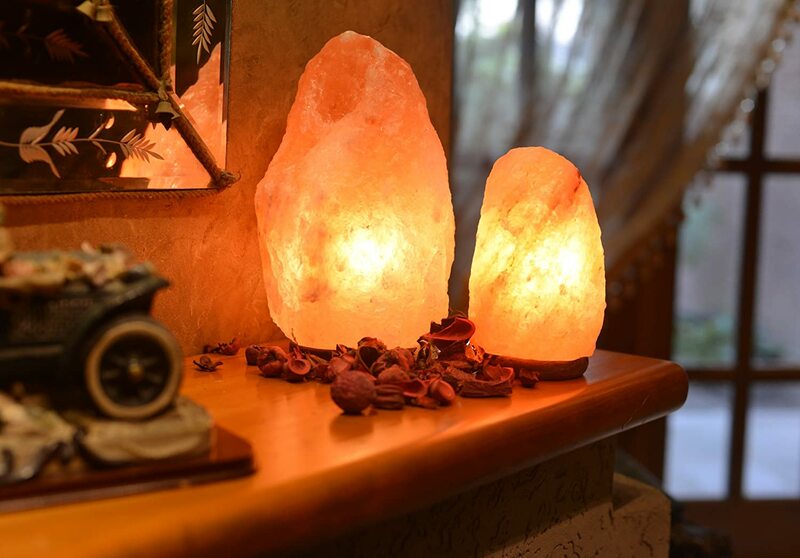 The Aloha Bay and Himalayan Salt Shop lamps are made from salt crystal rocks formed by nature over a hundred million years ago and are mined over 500 yards underground in the foothills of the Himalayas, where pollution is non-existent. When mining the salt crystals, explosives are strictly prohibited to preserve the structures of the crystals, and the lamps are carefully crafted by hand to retain the unique and natural shape of the rock. The result is a rare crystal, with beautiful colors ranging from off-white to apricot and warm pink. A Himalayan crystal salt lamp is a natural ionizer. This means that it provides the positive “good vibes” you experience when near a waterfall or the beach, where negative ions are naturally generated by these forces of Nature. It can also be used as a medium to alleviate several ailments and disorders, including preventing allergy symptoms from surfacing and helping quell other illnesses such as Attention Deficit Disorder. A Himalayan salt lamp also has a healing effect on the skin and even the mind, encouraging concentration and focus. A Himalayan Salt Lamp is made from a chunk of salt crystal rock that was taken from the salt mines found in underground caves in the foothills of the Himalayan Mountains. The Himalayan salt lamp makes use of the minerals that have been preserved for millions of years, releasing their special properties through the introduction of heat from an electric bulb or from the flame of a candle. These special properties emitted from the Salt Lamp are responsible for promoting the health and wellness of individuals via ionization of the air and the eradication of pollution. The special properties of the Himalayan Salt Lamp consist of negatively charged ions that act on the contaminants in the air by neutralizing them and weighing them down so they can no longer circulate. When this occurs, individuals can breathe more easily and many ailments and allergies that frequently afflict them start to disappear. Imagine that you have in your possession a geological treasure that dates back millions of years – before mankind appeared – and holds the earth’s secrets inside. Imagine that this jewel, which also holds the memory of the sea, is a tool for vitality an spiritual growth. This dream can now be reality thanks to crystal salt lamps, unique in their origin, age, and surprising powers of harmonization and revitalization. Rock salt is found in deep deposits in many regions of the world, including France, Poland, and Persia to name just a few. If forms crystals when it is pressurized deep inside the earth. The Himalayan mountains are home to particularly old and lovely varieties of salt crystal, which are becoming increasingly popular around the world for use as table salt and bath salts, in addition to the much loved crystal salt lamps. These blocks of rock salt crystal from deep in the Himalayan mountains have absorbed mineral elements that enrich them and give them their delicate tones. Unlike regular rock salt, which is extracted from industrial quarries that can reach over half a mile deep, Himalayan salt crystal is extracted by traditional methods that have been used for thousands of years. The benefits of salt as a natural cleanser have been known for millennia and I have written several blog posts about this wonderful health aid. The benefits of salt air inhalation, also known as speleotherapy or halotherapy, were first documented over 200 years ago in Europe when it was realized that salt miners were relatively free of respiratory ailments. Since then, many people have been flocking to salt mines around the world to help rid themselves of respiratory ailments of all kinds, including asthma, congestion, hay fever, and allergies. Salt is known for its anti-microbial, anti-bacterial, and anti-fungal properties. Here in the United States, such treatment is only now starting to become more widely known and appreciated with the introduction of “salt rooms” in spas and other wellness businesses. But that is changing; even Dr. Oz has recommended using salt inhalers on his program. You can now benefit from this all-natural salt air therapy at home with a Himalayan salt inhaler, such as the high quality ceramic one made by The Himalayan Salt Shop. For optimal results, it’s recommended that the inhaler be used for 15 minutes a day – this can be broken down in intervals during the day. It is also recommended that the salt be changed every 90 days with refills that are available on-line. Try this simple, yet amazing natural device and see how it can benefit you. I am a return customer. We found your site on the internet. We received a salt lamp as a gift and fell in love with it and purchased 3 more. After seeing the salt inhaler on your site, I bought it and I love it!! In the past year I have tried all forms of treatment for clearing my respiratory system. I actually saw results after the second day!! I use it every day for 20 minutes. I love all your products that we have purchased. I still need to buy some more lamps so every room in my house will have salt lamps in them. — Marianne B. Be sure to check out their package deals where you can really save, e. g. get two 4 to 5 lb. lamps and two candle holders for only $39.99. Free Event On Nutrition, Weight, Body Image and MORE! A Strawberry, Peanut Butter and Tuna Sandwich?! I’m glad that I came across your article about benefits of salt lamps. I have these amazing lamps in my home and office. Though at first I bought these lamps just for decoration purpose. But then I heard that they have other benefits as well. These lamps actually clean the air and make it fresh. These lamps have positive impact on my mood. I just love these lamps. I cannot imagine my home without these lamps. You can visit the given website to know more about different types of salt lamps. It’so well written article. Thanks for sharing. I’m also experiencing its benefits. I’m using Himalayan salt lamps from saltean. You are absolutely right. They are not only used for decorative purpose, but also acts as air purifier. Thanks for sharing such an informative article. I also have Himalayan salt lamps in my house. These lamps are just more than awesome. They are not only beautiful but also have health and healing benefits for human mind and body as you have mentioned above. They eliminate all the dust particles and smoke from the air and make it pure and fresh. They help me in relieving stress and depression and improve the sleep cycle. I bought my lamps from ittefaqco at a very reasonable price and they are of great quality. My little girl, now at 26 years old, has endured with asthma issues the majority of her grown-up life. I am very happy to see this beautiful post, thank you for giving every one of us this data and this breathtaking open door! Thanks for your comment. Fortunately there are other all-natural ways of helping w/ asthma, too. p.s. I removed the link from your comment because I wanted to be sure it wasn’t made just for marketing purposes. Hope you understand.